Shortly after my third child, Theo, was born, I stopped brushing my hair. It was a matter of too much on my plate, and way too much hair to brush, haha. I won’t go into the details about how that worked out in the long run (let’s just say my mother-in-law had to get busy with the scissors) but I was in serious need of a helpful hair-hiding hat during that time. That’s how my Cadence Cabled Cloche was born. It’s an elegant hat featuring gorgeous design elements that might help trick people into thinking you actually take care of yourself! Haha. 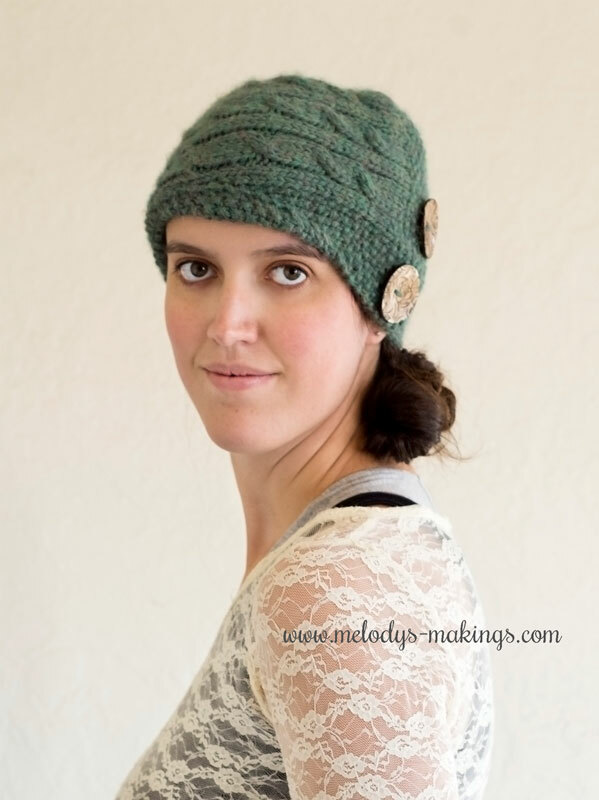 This free knit hat pattern features bulky (5) weight yarn and size 5.5mm (US9) knitting needles. Pattern features all sizes Toddler, Child, and Adult. Yarn: Approximately 100 yards of bulky (5) weight yarn for smaller sizes, and approximately 175 yards for larger sizes (I used Plymouth Baby Alpaca Grande for mine). Repeat row 1 until your piece measures approx. 1.5 inches (3.75cm) from the cast on edge. Repeat rows 8-13 until your piece measures approx. 19 inches (48.25cm) from the starting edge. End on a repeat of row 13. Bind off as if to knit. Secure work, and using your yarn or tapestry needle, sew the cast on edge of your work over the bind off edge of your work with a 1 inch (2.5cm) overlap. If the starting section is slightly wider than the ending section due to the tension of the cables, fold down the top of the starting section and secure it to the inside of your hat so your piece is even all the way around. When picking up sts during the next section, you can either pull sts from the top of this fold or from the overlapped section behind it. This creates the majority of your hat. Now we’ll be closing the top section. Pick up and Knit 72 sts around the top of your hat using Double Pointed Needles or Magic Loop Method. Make sure the stitches are evenly spaced, and that you’re doing your knit stitch around the single purl stitch we did along this edge. Join in the round and place stitch marker. Knit side should be facing out. Do not bind off. Cut approx. 7 inch tail. Using yarn needle, remove all sts from DPNs or magic loop, as if to purl. Pull tail through to cinch the top of hat. Using yarn needle, pull tail through to the inside of the hat. Tie a knot and secure and weave in all ends. Add two matching buttons (I used 1.5”) stacked one on top of the other over the overlapping section of your hat. Then, fold up approx. 1.5 inches (3.75cm) of the brim of hat on the opposite side from the buttons. Leave the front section slanting down as pictured. You can either leave this just as a fold or choose to use your yarn or tapestry needle to tack this section in place. Secure and weave in all ends. Repeat rows 8-13 until your piece measures approx. 20 inches (50.75cm) from the starting edge. End on a repeat of row 13. Repeat row 1 until your piece measures approx. 2 inches (5cm) from the cast on edge. Repeat rows 8-13 until your piece measures approx. 22 inches (55.75cm) from the starting edge. End on a repeat of row 13. Pick up and Knit 84 sts around the top of your hat using Double Pointed Needles or Magic Loop Method. Make sure the stitches are evenly spaced, and that you’re doing your knit stitch around the single purl stitch we did along this edge. Join in the round and place stitch marker. Knit side should be facing out. Add two matching buttons (I used 1.5”) stacked one on top of the other over the overlapping section of your hat. Then, fold up approx. 2 inches (5cm) of the brim of hat on the opposite side from the buttons. Leave the front section slanting down as pictured. You can either leave this just as a fold or choose to use your yarn or tapestry needle to tack this section in place. Secure and weave in all ends. I love making cables. They are really easy. Have so many sweaters and Christmas decorations with cables.